I can't believe I have been so remiss in my diary entries latelt! I have so much to report on too. On Thursday, December 1, the four of us- ANGEL, KARA DREAM, DARRAMY and SERENDIPITY- braced ourselves for the dreaded last leg of our voyage to Cartagena, with its fabled 30 knot winds at the harbour entrance. It turned out to be one of our most pleasant and begnign passages ever! The winds were light, the seas low and it was enjoyable to have friends in sight all the way. 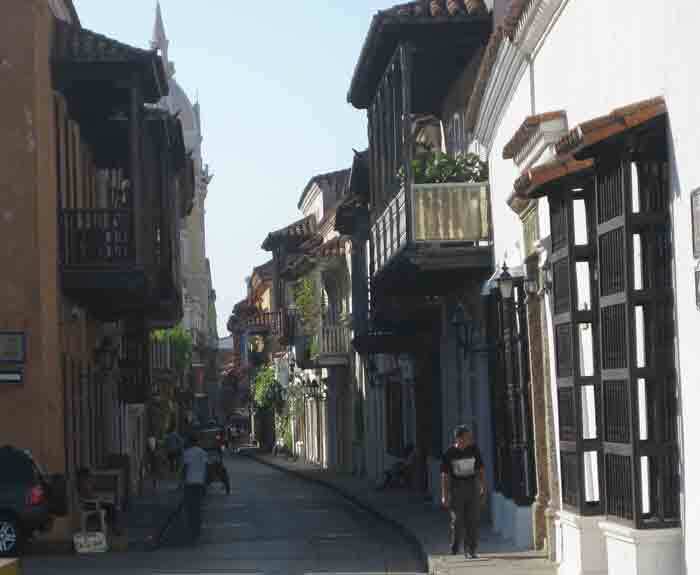 Cartagena is quite a magical city- a trip back to Spanish Colonial days. The bay was sighted by Columbus in 1494, but he didn't stop to visit. At that time it was an indigenous viallage named Calamari. Columbus' chronicler, Pedro Martir de Anleria, reported the sighting and its new name- Cartagena des Indias. It was first settled by Spaniards in 1510 and the city itself was founded by the conquistador Pedro de Heredia in 1533. It grew rapidly. But in 1552 it was reduced to ashes. Thereafter all buildings were constructed with stone, brick cement and tiles, earning it the nickname corralito de piedra ("stone playpen"). In 1614 the city walls were begun to protect the sea front. 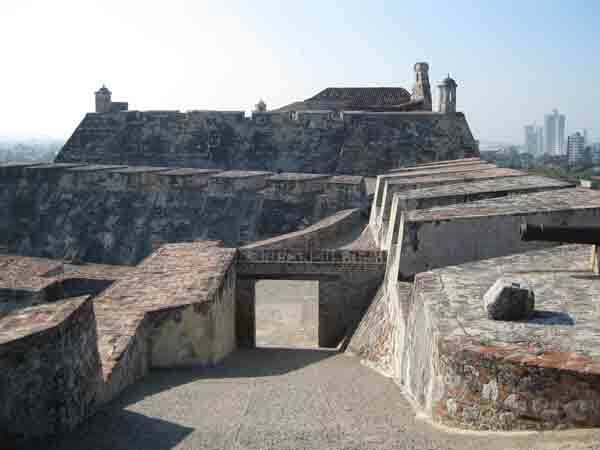 To protect the land side, a huge fortress, el castillo de San Felipe, was begun in 1636. 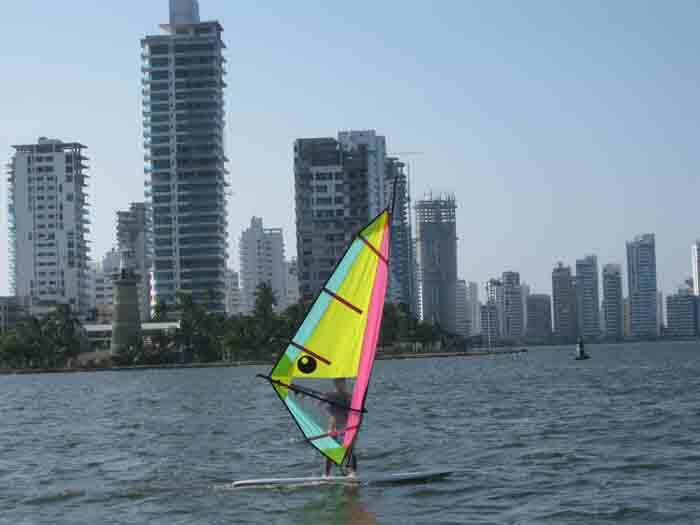 With its huge harbour and strategic location, Cartagena became the entrepot of goods travelling from Central and South America and from Asia and the Philippines to the Dominican republic and Spain. The transfer ships and Cartagena itself were constantly beset by enemy ships and privateers (among them Jack Hawkins and his nephew Francis Drake). It was quite successful in fending off these attacks, but was finally taken completely by SPAIN! 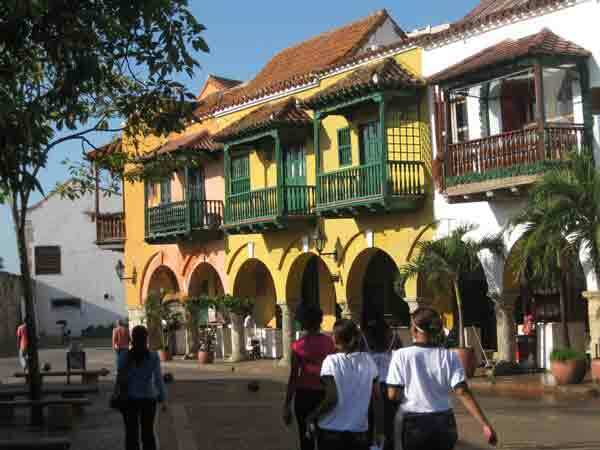 In 1811, Cartagena des Indias declared its independence. About 6,00 inhabitants, a thied of the population, were killed in the reconquest. The name La Heroica ("the heroic city") was bestowed upon the city by Simon Bolivar, the Great Liberator. 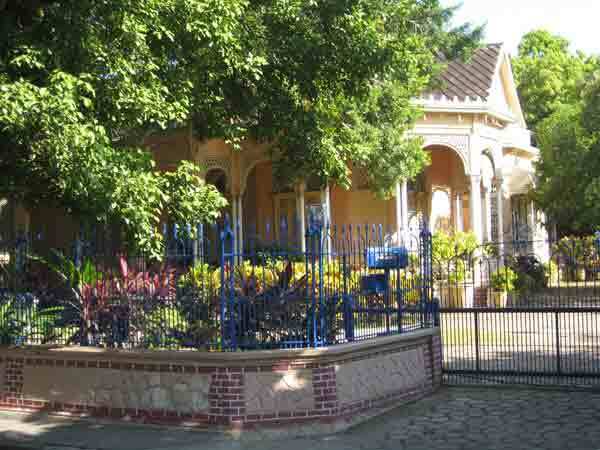 During Colonial times the Old City was divided into three section. It was a thriving commercial centre with narrow streets lined with the two-storey homes of the local gentry in the area called Centro. In the San Diego area were found the artisans and the Getsemani region nearest the city walls housed the general populace. Most of the buildings in the area have been maintained or restored and the city is now a UNESCO heritage site. In 1778 a sandbank which was a natural defence for the Bocagrande entrance to the harbour was replaced with a submerged sea wall. What a surprise for the first intruders trying to cross it afterwards! This was the entrance which we approached. There are now two lighted buoys one at either end of the 100m wide section that can be crossed. The water here is 11 feet deep and should be crossed on a heading of 121M. Then there is a maze of buoys to follow in order to reach the anchorage outside Club Nautico. The alternative entrance for large ships and cruise liners is called Boca Chica. However, small boats should never anchor there as it has a reputation for piracy. In fact, one sailboat arriving from Panama around sunset the day after we arrived was boarded by a manga of men with machetes and guns as they entered the boca. To the south protecting us is the statue of the Madonna and Child rising from the waters. MADONNA AND CHILD AND NAVAL FLEET- WE ARE VERY SAFE!! And what waters they are! They are virtually indescribable- dark brown, thoroughly contaminated and at times highly oderiferous. One would be leery of dropping a flame into the waters as the floating fuel might wreak havoc! No more swimming until we reach the Rosarios! We are about to contact a local free diver to scrape off the barnacles each week! Some people are not afraid of the water!